Of all the personalities who have come and gone in the business of professional wrestling, few divide opinion more than Eric Bischoff. For some, he displayed the skills of a pioneer, a visionary, a truly creative promoter. To others, he was lucky, in the right place at the right time as he benefitted from someone else's money, a man who provided minimal input into key storylines and who was viewed as poisonous by a mutinous locker room. If nothing else, Bischoff has built himself an unforgettable career in the genre of sports entertainment, and his life and times are examined in this new DVD. 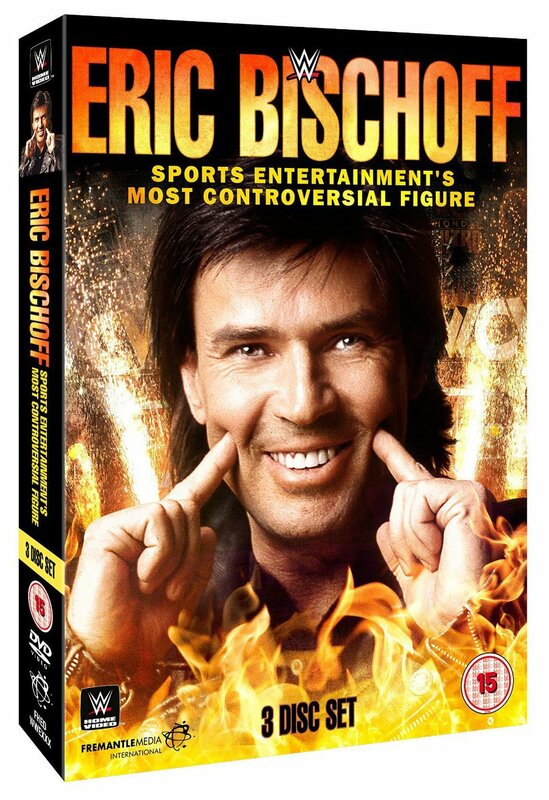 It's worth wondering why now; why are we getting a Bischoff DVD in 2016 and not in the mid-2000s during his WWE tenure, or even shortly after the demise of WCW in 2001? Well, it's been a long time since we've seen Bischoff in a WWE ring, so there is nostalgic appeal to revisiting Bischoff's career here. More likely though, this release probably stems from the lack of performers left who WWE hasn't yet released a DVD/Blu-ray on. That would explain why we get this bio on a non-wrestler many years after his peak, even if the documentary still has the potential to be intriguing. Speaking of which, the main basis of this release is the 90-minute documentary feature which charts Bischoff's early years, during which time he competed in martial arts and worked as a model (where he met his wife Loree), before the opportunity to promote a children's game on AWA television opened the door to what would eventually be a sales position with the AWA in the mid-1980s. Following unforeseen problems with the AWA's announcers, Bischoff was utilised as an interviewer, eventually becoming a fixture of AWA television. It's worth noting that at this point Bischoff was already in his 30s, so it's hard to believe that anybody could have imagined at this point what would await Eric in his future. His AWA stint had a setback when the company itself struggled to stay afloat, leaving performers such as Bischoff without pay for months. With Bischoff close to bankruptcy, and after an unsuccessful audition as an interviewer for the World Wrestling Federation, he managed to get a job in World Championship Wrestling as an interviewer and a commentator, primarily for WCW's B-shows. However, by 1993, a chain of events and a well-planned pitch involving a potential wrestling-based gameshow unexpectedly propelled Bischoff to the position of Executive Producer in WCW; suddenly, Uncle Eric was in charge of the second biggest wrestling company in America. That being said, WCW was truly struggling at this point, so few had hope that Bischoff could reverse the organisation's fortunes. But he did: a deal was struck to broadcast WCW television from Disney studios in the Orlando theme park, and with the perception of the promotion growing, he somehow managed to bring Hulk Hogan into the company in summer 1994, followed by Randy Savage at the end of the year. With ratings and PPV buy rates increasing, along with other subtle changes on- and off-screen, Bischoff believed the step towards making WCW profitable was an exciting yet potentially risky TV deal with Star TV in China. But when Eric was pitching the idea, he was interrupted by the head honcho of Turner Broadcasting, the parent company of WCW, Ted Turner, who asked Bischoff how WCW could compete with the WWF. A mumbled response about prime-time TV led to one of the most important decisions in wrestling history: Turner allocated WCW a prime-time TV show on the TNT channel - head-to-head with WWF Raw on Monday nights. Bischoff explains his thought process to ensure that what would become Monday Nitro could stand out from Raw to increase its chances of success, along with his formula for major storylines in general, the biggest of which would be the nWo. This ground-breaking storyline began in May 1996 with Nitro being relatively competitive with Raw, and by the time the plot reached its peak with (the anticlimactic) Hogan-Sting main event at Starrcade 1997, the storyline had turned WCW into a monster, which was handily winning the Monday Night War; the nWo plot had seen the once money-losing company become a hugely profitable financial beast. Add to that other elements of the show, such as the rise of Goldberg and the impact of the cruiserweights, and Bischoff seemed to have the wrestling world at his feet; from the summer of 1996 until early 1998, Bischoff was, as he would say on Nitro in his heel persona (Eric had by now joined the nWo and become something of a mouthpiece for the new World order), the "King" of wrestling. Who could have imagined, even two years earlier, that Bischoff would be defeating Vince McMahon on a weekly basis? But then it began to unravel. As the WWF transformed its product to incorporate a new "Attitude", Bischoff notes how the Turner/Time Warner merger began to limit what WCW could do in order to remain competitive and, ultimately, their control reached the point where Bischoff could almost do nothing to reverse fortunes. At least, that's what he says. What is only slightly acknowledged is how, by the summer of 1998, WCW's main event crew still largely consisted of WWF headliners who were many years past their prime. For example, Hogan's career had years added onto it when he turned heel in 1996, but by 1998 his heel run had peaked, and he was now in his mid-40s, rarely putting on a good show in the ring. There was no potential for genuine main event ascendency for younger stars, with the exception of Goldberg and Diamond Dallas Page (who, despite his high quality skills, was largely viewed as someone who only reached the top due to his friendship with Bischoff), and as the number of WWF stars who WCW were poaching began to dwindle, the storylines became equally illogical. The Hogan/Ultimate Warrior re-run flopped, as did the mismanagement of Bret Hart once he joined the company; then there was the Rick Steiner/Chucky the doll business, the involvement of Jay Leno in a PPV main event, the never-ending and confusing nWo saga and more. It was still a huge company and still strong competition for the WWF, but by the end of 1998, it was obvious that WCW's fortunes were plummeting, as were its morale and its viewership. Things got much worse in 1999, to the extent that Bischoff was removed from power in September 1999. His replacement Vince Russo flopped so bad that people thought he was still secretly working for the WWF, and after he was fired in January 2000 and his successor Kevin Sullivan couldn't do much better, by which point WCW's ratings and creativity were at toilet level, Bischoff and Russo were made a creative team of sorts in the spring of 2000, and they created a "new beginning" for WCW in a last-ditch attempt to save the now-ailing promotion. But Russo's garbage was just appalling to watch (Viagra On A Pole, anyone? ), and after the Bash At The Beach 2000 incident, Bischoff (who was Russo's superior more than he was a partner, meaning that Russo created most of WCW's output) voluntarily left and was essentially waiting for Russo to truly fail and leave for good. During this time, Bischoff approached Time Warner executive Brad Siegel about purchasing the promotion, believing that it could never succeed under Time Warner. That he did, or at least he and Fusient Media Ventures were in a position where they only needed the go-ahead to buy WCW and relaunch it. Only, it didn't happen; Time Warner managed with AOL, and shortly afterwards, new head honcho Jamie Kellner made the dumb decision to cancel WCW television outright and immediately, rather than allowing the promotion to be sold so AOL Time Warner could at least make some money before removing WCW from TNT and TBS. This meant that Bischoff's "new" WCW wouldn't have a home, and whilst I wonder today why he and Fusient didn't just try to shop around for a new television station for months after this decision, this cancellation essentially killed WCW. Days later, Vince McMahon (or Shane, depending on your point of view) officially announced the purchase of WCW on Nitro, and as of March 26 2001, WCW as a real company, and Bischoff's wrestling career it seemed, had ended. But after some dabbling into smaller ventures, Bischoff was ultimately signed by what was now World Wrestling Entertainment to work as a non-wrestler and, on July 15 2002, the true "never say never" moment occurred as, live on Raw, Vince McMahon introduced and endorsed Bischoff as the new General Manager of the show. Following several years of on-screen highs and lows, Bischoff was fired in a "trial" on December 5 2005 and, barring the release of his autobiography Controversy Creates Cash in 2006 and selected on-screen appearances in 2006 and 2007, his WWE run ended there. All of this is covered in the documentary, which is well-structured, paced just right and packed with honest comments from Bischoff and others, such as his wife Loree, key members of WCW's parent company like Bill Shaw and Harvey Schiller, and wrestling personalities including Greg Gagne, Hulk Hogan, Chris Jericho, Kevin Nash, Steve Austin and others. As Bischoff's history is documented, we also get a section where Bischoff answers many criticisms levelled at him, from his lack of focus on younger talent (which he freely admits) to his loss of control involving main event stars such as Hogan (incidentally, the scene which leads into this section is shown twice, for some reason). At times, it feels more like a history of WCW than a history of Bischoff, since we only get a small insight into Bischoff's WWE run, once his first night in the company is covered. Additionally, those (like me) who have read Bischoff's autobiography will be familiar with many of the stories told on this DVD. That being said, the documentary is entertaining, and very interesting for those keen on knowing about the behind-the-scenes mechanisms of wrestling companies. Its big flaws, to me, are that certain key events are not referenced, such as the Lex Luger debut on the first Nitro, his incredible off-screen struggles with Ric Flair in 1998 (Bischoff actually threatened to sue Flair's family into bankruptcy for real in front of the WCW roster; one could argue that Flair has half-reached that point without Bischoff's input), the BATB 2000 mess involving Hogan and Russo, the "HLA" storyline in WWE (for Hot Lesbian Action; I'm not disappointed that this wasn't covered, but you might be), his on-screen association with his "nephew" Eugene, and his TNA stint from early 2010 to late 2013 (hey, TNA was covered on the Sting and Dudley Boyz DVDs), which saw Bischoff and Hogan provide a grand total of around zero fresh ideas and ultimately cause more harm than good for the promotion. Harking back to an earlier point, we do not get a proper acknowledgement that a big reason for WCW's decline was that its television product rapidly turned into the s--ts, from early 1999 onwards. WWE is adding Nitro episodes from its final 18 months onto the Network as we speak, and I honestly feel that I couldn't watch them if you paid me. Regardless of the internal struggles with Time Warner, there is no way of explaining WCW's crap storylines and frustrating matches besides the obvious: the people in charge were not competent and/or too lazy to create excitement and logic in their television plotlines. Admittedly, Russo had a more detrimental effect once he arrived, but the slog began with Bischoff in control. Yes, Kevin Nash was the booker for much of 1999, but Bischoff was the man who gave him that role, and did nothing to change things even when it was clear that WCW was sucking more than - well, I was going to insert a rude joke but I won't, so just use your imagination. Regardless, though, the documentary here is still pretty good, and it does contain some interesting nuggets, from Bischoff discussing his first conversation about Vince concerning his WWE signing in 2002 to Eric's beliefs that he's now happy that WWE beat WCW, since it led to such things as the Network and other future areas for growth which WCW would not have thought of or considered. On this DVD, we also get Bischoff's two-part discussion with John Bradshaw Layfield on Legends With JBL from the Network, which does cover some similar ground, but also allows Bischoff to explain some subjects in greater detail, and to cover topics not featured in the doc (like BATB 2000). Another Network exclusive turns up here as we count down and relive what are supposedly Bischoff's ten most controversial on-screen moments. Rounding off the DVD are some bonus stories and a selection of on-screen clips from Bischoff's time in the AWA, WCW (of course) and WWE. Since Bischoff was never a wrestler, it stands to reason that they are almost all angles or interviews, although we do get Bischoff vs. Larry Zbyszko from Starrcade 1997. There are more matches on the Blu-ray version, but neither of Bischoff's matches with Steve Austin from 2003 are included at all, which is a strange oversight. Going back to the DVD, the highlights of the "angle extras" are Bischoff being attacked by the Outsiders in 1996, his challenge to Vince McMahon on Nitro in 1998 to counter the attempted "invasion" from D-Generation X, his WWE arrival, his involvement in the Billy & Chuck wedding in September 2002 (by the way, I thought this was tremendous; the presentation was topnotch, and Bischoff's role in the ceremony was a massive surprise when I watched it at the time), some scrapes with Steve Austin (including a Highlight Reel alongside Chris Jericho at InsurreXtion 2003, which I attended and is very entertaining), and the entirety of "The Trial Of Eric Bischoff" from when he was fired as Raw GM in 2005, the comedy of which is hit-and-miss. It might be stating the obvious here, but this is aimed at fans who were watching WCW and/or are familiar with the Monday Night Wars. Those who have only been watching wrestling over the last decade may have no clue who Bischoff is. If that's the case, this DVD is a good way to get you up to speed into the man who, regardless of one's opinion on him, played a key role in a series of events which changed the WWF/WWE and pro wrestling forever. The documentary is enjoyable, if lacking in big revelations, and the extras are worth watching on the whole (the JBL sit-down interview is arguably more insightful than the doc). Yes, it doesn't cover some vital topics (WCW's sucky on-screen product towards the end, the Bischoff-Flair off-screen turmoil, Bischoff's run in TNA), but for those who watch these DVDs just for entertainment purposes, you'll find it to be a lot of fun. And watching this DVD, one gets the feeling that Raw or SmackDown would be a lot better, and the crowd reaction would be huge, if Bischoff appeared on WWE television once more as part of the upcoming brand extension to become a General Manager again. This isn't as good as the Paul Heyman DVD, since Heyman's off-screen future was far more explosive and his honesty is almost unparalled on virtually any subject, but it is an entertaining and at times insightful look at one of the most important and influential figures from the most exciting era in wrestling history.